The service provided by the Company of the Guard shall now be taken over by the Company of Carabiniers. Thereafter, they took the name of the “Palace Guards.” Since this time, their primary function has been to ensure the security of His Serene Highness the Sovereign Prince and the princely family, and all of his properties and residences within the immediate vicinity of the Principality of Monaco. Also, since this time, the Palace Guards are entrusted to provide a guard of honour for official, civil, and religious ceremonies and ceremonial parades. They also ensure that laws are enforced and participate in maintaining public order and carry out all duties ordered by the prince. In the capacity of daily ceremony and in the function as guards of the palace, a changing-of-the-guard ceremony takes place each day at 11:55 a.m. Today, the unit consists of 119 soldiers and is composed of three officers, 19 non-commissioned officers, and 97 brigadiers and ordinary soldiers. An additional task entrusted to the Palace Guards is their contribution to the Monegasque Red Cross. As they are all qualified in first aid and run the Red Cross ambulance brigade, they participate in providing security for key sporting, cultural, financial, and artistic events taking place within the principality. The Palace Guards are also crucial in contributing to and participating in implementing emergency plans which may pertain to serious incidents that might cause extensive damage to persons and property. Since Monaco is a coastal territory, maritime security is also a primary concern. The Palace Guards have a team of qualified divers who participate in security measures at key sporting events in Monegasque waters and organise underwater scientific observations for various studies carried out in the Mediterranean. The Palace Guards have inherited a long reputation of trust and security for the principality and have their own dedicated museum in Monte Carlo: The Museum of the Princes of Monaco and Their Guards. This year, the Carabiniers celebrated the day of their patron saint, Sebastian, on the 20th January. It was more poignant than previous such events, as it was part of the year-long celebrations which extend to December and their bicentenary anniversary. 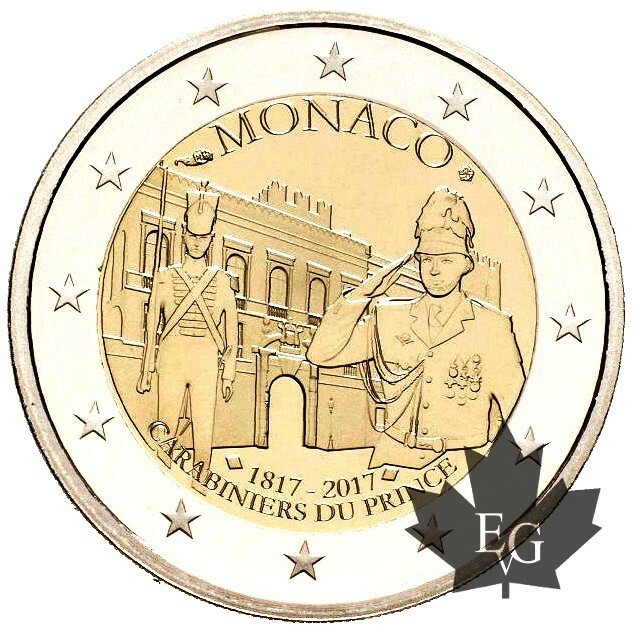 The coin is produced by the Monnaie de Paris on behalf of the treasury of the Principality of Monaco. 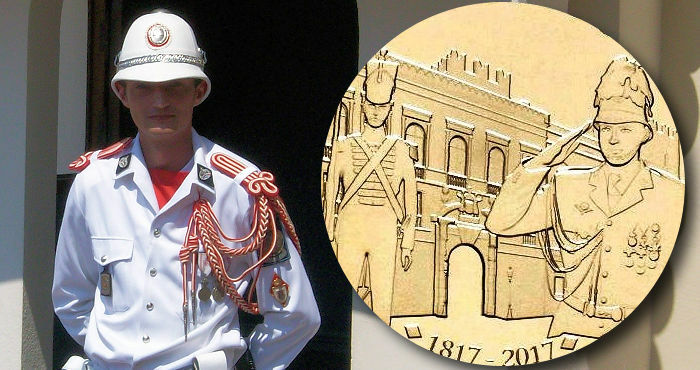 The obverse design depicts a member of the Carabiniers in the style of uniform as they appeared at the time of their foundation in 1817 and a palace guard as they are seen today. The prince’s palace provides a background, and a commemorative text including the years 1817–2017 is placed just under the primary design. The 12 stars of the EU surround the entire motif. The reverse of the €2 coin bears the common design used on all euro-zone circulation-type coinage. The coin is presented in a custom red leather case embossed with the crest of Monaco and includes a numbered certificate of authenticity. 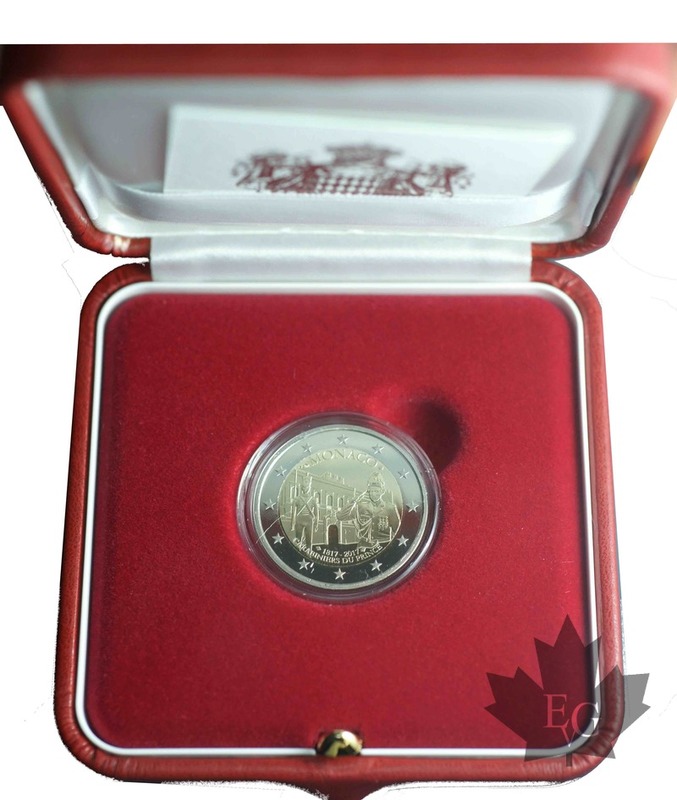 For additional information, or to purchase, please visit the website of Editions Gadoury, retailers of a wide selection of Monegasque international gold and silver coins.